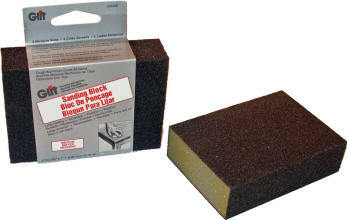 Our flexible sanding sponges feature aluminum oxide abrasive cloth on four sides over a soft foam core. The size of 2¾ x 4 x 1 is ideal for hand sanding of both flat and contoured surfaces. The pads can be rinsed with water to clean sanding debris and extend their useful life. Available in both #600130 medium (100-120 grit range) and #600130 fine (180-220 grit range). They can be used wet or dry. We only accept PayPal shopping cart payments for orders with fixed rate S&H to the L48 U.S. states.